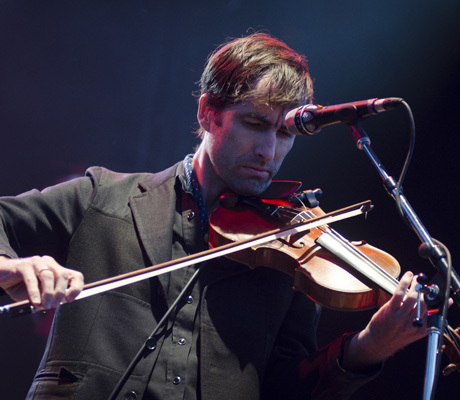 As Lady Gaga brought her monolith circus to the Ottawa Bluesfest's main stage, Andrew Bird headlined the quaint River Stage with a performance that was just as theatrical and affected. With a stage set-up that was equal parts Wes Anderson and Nikolai Tesla, Bird greeted his overdressed and under-boozed fans to a new live sound and new live band. Starting off the show with only a violin, electric guitar and looper pedal, Bird stood in front of an over-sized Leslie speaker while proceeding to craft his brand of precious chamber rock. Bringing out Hands of Glory, his new band featuring his former Bowl of Fire band-mates Kevin O'Donnell and Eric Heywood alongside singer/songwriters Alan Hampton and Tift Merritt, Bird gave an old-timey treatment to a number of songs in his catalogue, including Bowl of Fire's "Dear Old Greenland" and a handful of Handsome Family covers from his latest LP, Things Are Really Great Here... Sort Of. As Andrew seemed jubilant and joyously cozy with his latest stage creation, it was the inclusion on Tift Merritt that gave the songs a new dimension, as the Carolina guitarist/vocalist fed off of the incredible chemistry she was able to draw from Bird. Coming back out to perform a solo encore, Bird wooed the crowd while demonstrating just how much of his stage show counts on old-fashioned charm.